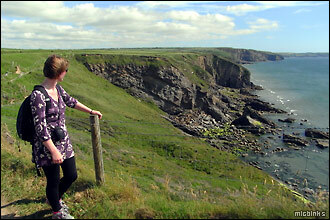 Opened in 1970, the Pembrokeshire Coast Path was the first National Trail in Wales. Now, walking the entire 186 miles (299km) with ascents and descents equivalent to climbing Everest was way beyond our week's Pembrokeshire holiday, so we picked some scenic sections to stroll around St Davids Peninsula, St Brides Bay and Trefin. The magnificent coastal walking was the primary attraction for us in Pembrokeshire and we enjoyed the dramatic Welsh landscape in some glorious weather - just the ticket for fair weather walkers like us! 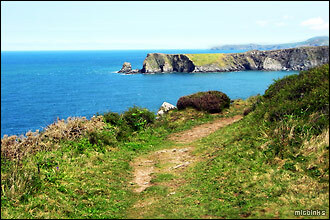 ...and this section, between Trefin and Porthgain, is typical of the trail here towards Strumble Head with a rugged coastline, jagged cliffs and craggy outcrops making for some spectacular scenery. 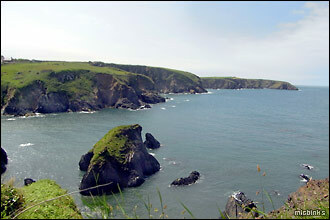 ...the superb coastal view. 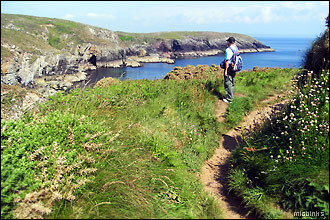 We were soon joined by a group of serious walkers walking the entire Pembrokeshire Coast Path over a few weeks. 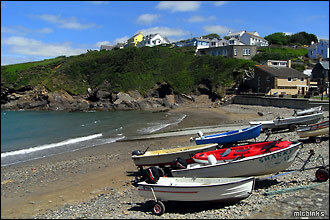 ...in a small picturesque cove above the beach. 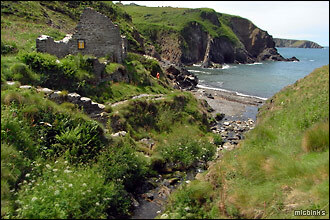 What a marvellous outlook those Melin Trefin corn mill workers had from their 'office'! Phew, another hot climb upwards then, and on the headland above the beach we found a stone circle, and yet another place to pause and admire the view. 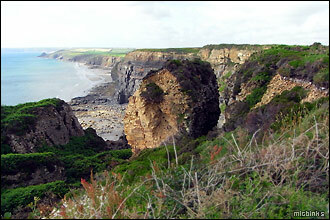 Another day, and another scenic walk along a different section of the Pembrokeshire Coast Path - along St Brides Bay between Nolton Haven (above), through Broad Haven to Little Haven. Fortunately we experienced fine weather throughout our coastal walking; this bit close to the path edge would be well scary if it were blowing a gale and bucketing down! 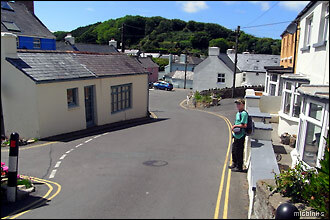 Yet another wonderfully scenic coastal view. 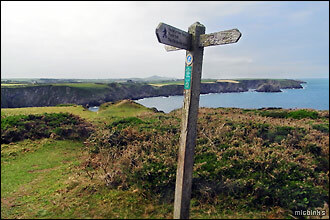 There's a coastal bus network covering the length of the Pembrokeshire Coast Path, enabling walkers to walk a section and get the bus back. 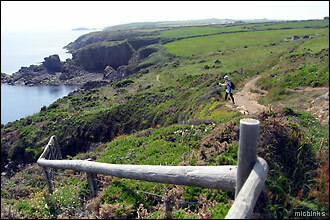 We used the Puffin Shuttle on this St Brides Bay section, bus details are in our tourist resources. 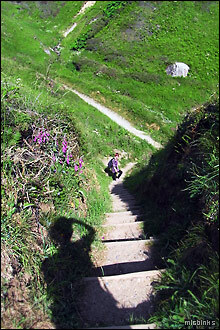 Downs and ups on the Pembrokeshire Coast Path. 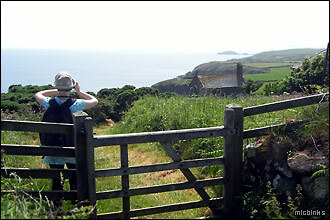 This is near the stunning viewpoint at Haroldston Chins from where, on a clear day, Skomer and Ramsey Islands can be seen at each end of St Brides Bay. Today the heat haze spoiled our view. 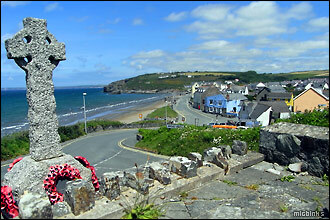 ...a short stop for a coffee we passed through and took a rest at this memorial looking down at Broad Haven. 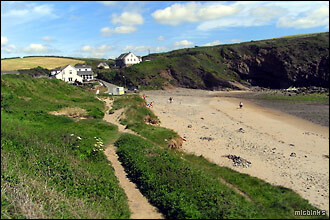 The coast path route from here to Little Haven uses the narrow road (or via the beach at low tide). 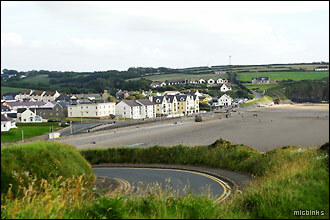 ...overlooks the beach, to support the local economy. We can happily report our well deserved pints didn't touch the sides! 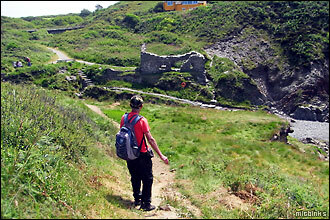 While walking the Pembrokeshire Coast Path we nabbed some geocaches; this section providing some scenic finds in Broad Haven and Nolton Haven. 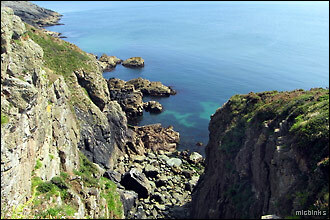 ...cliff-top location overlooking the rocky coastline. 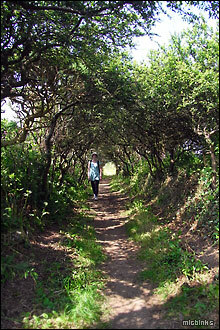 Yes, it was another hot day for what was probably the most delightful section of our coastal walking. 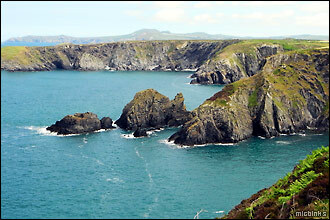 The coast here on St Davids Peninsula has some of the oldest rocks found in Pembrokeshire and is at the heart of the Pembrokeshire Coast National Park. 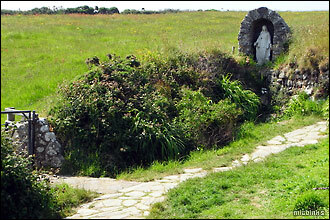 ...the coast path, and past the statue of St Non with her arms outstretched in compassion. 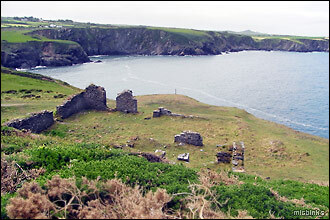 The ruins of St Non's Chapel, widely regarded to mark the place where St Non gave birth to St David in the year 500 during a violent storm, is adjoining. 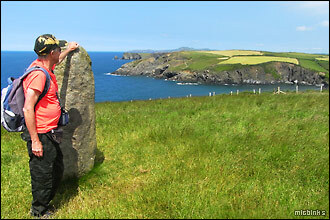 These ancient monuments are set in an amazingly idyllic location right by the Pembrokeshire Coast Path. 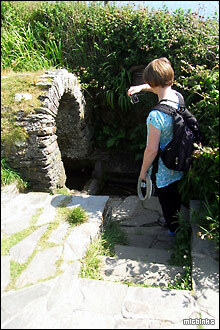 The Holy Well is a famous place for healing. 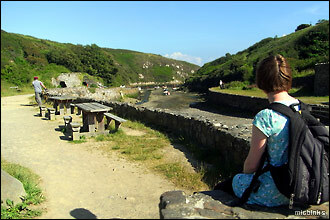 ...we hit delightful Porthclais at the River Alun, famous for its scenic cove and lime kilns. 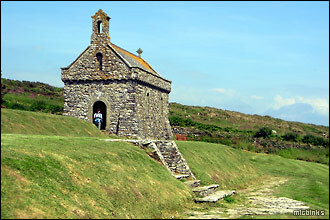 Join us on the next page of our Pembrokeshire holiday, visiting the city of St Davids, the cathedral, and Bishop’s Palace >>>. 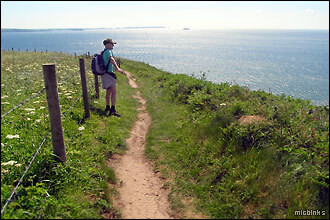 We've also done some wonderful coastal path walking in Gower, Devon, Cornwall, Dorset, and walking in the Wye Valley. And done some mountain walking up Snowdon's Pyg Track.